Floating vertically on the other hand is one of those fun things to explore with no particular purpose behind it. Most people just like to see if they can do it. The physics around floating doesn’t change, of course, whether you float horizontally or vertically. 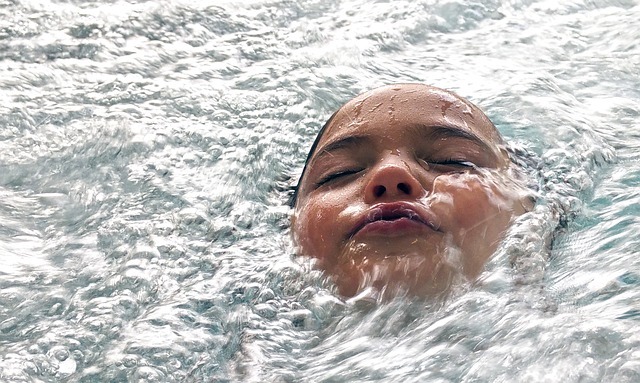 What’s different is that in a head up – feet down position the water doesn’t have as much surface area to push against, which means your body will be submerged more or less completely. Whether or not you’ll be able to breathe in that position will depend on your buoyancy which in turn comes down to your very personal density as explained further above. In a nutshell, the more fat you have the more buoyant you are. The following steps will work for most people unless they are very slim or very muscular like a bodybuilder on a no-fat diet. If you are that kind of person you can still give it a go and will very likely find that your feet don’t sink all the way down to the bottom of the pool but instead stay suspended. However, your head will sink to just under the water surface. Here is how to best go into and stay in the vertical floating position. Allow your legs to relax and sink down. With that relaxation will come a little bend of the knees – that’s fine. Relax and spread your arms wide to each side for maximum surface area. Take a big, deep breath to have maximum buoyancy and tilt your head back so your mouth and nose point upwards. Stay calm and relaxed. Breathe gently in and out if you have enough buoyancy to keep your nose and mouth above the waterline. If you sink too low, you might have to do a few gentle kicks with your legs to get just that bit above the water line to breathe. Don’t kick too hard because that will cause too much bobbing up and down. Here is an interesting step up from just floating. Ever had one of these deep-sea toy divers that could go up und down in water depending on pressure? Well, the vertical float fallout looks very similar. Only the up and down movement comes from changing the amount of air in your lungs. Watch the video below to see how to align your whole body and breathe to move yourself along a nice vertical axis.